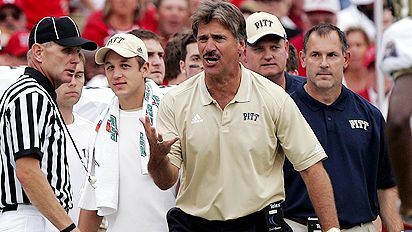 In somewhat of a surprising move the Pitt Panthers have gotten rid of Dave Wannstedt. Surprising because his teams have finished no worse than tied for 2nd in the Big East over the last three years. While it's true that his 42 - 31 overall record since taking the helm isn't very inspiring when you consider that he has been landing one top recruiting class after another. Unfortunately his top recruiting classes haven't correlated to top teams on the field. His best year was 2009 when the finished ranked 15th in the country. But my question is does Pitt really think they can do better than him? Who REALLY wants to go to Pitt right now? I'd be shocked if they landed a bigger name coach than Wannstedt. Actually they should give Josh McDaniels a call, I heard he was available.